Authentic ATI ProCharger Pulley's in all available sizes! Includes retaining bolt, washer and key. Note: Put in the notes section which vehicle make and model you have. Let's take a six rib pulley for an example. 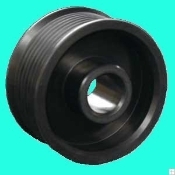 DP400I-06D - This pulley is a 4.00 diameter size. The 06D means it is a six rib. Maximum impeller speed = crankshaft pulley diameter (N1) divided by supercharger pulley diameter (N2),multiplied by the step-up ratio (4.10 for the P-series/D series - 5.40 for the F series), multiplied by engine rpm at redline. How much boost the blower can produce depends on many variables. * Cubic inch. The larger the engine the less boost it will make with a supercharger. * Headers and exhaust. A better flowing system will produce less boost, requires a smaller pulley to regain the loss in boost. Ultimately though, more power will be gained. * Camshaft and heads. A camshaft with some overlap will leak out some boost through the valves. Better flowing heads react a lot like a better flowing exhaust system. * Altitude. Elevation plays a big part in how much boost is produced. Those people living in the higher elevations have to spin the blower harder to see boost. * Condition of engine. An engine with real good sealing rings will ultimately produce more boost than one with worn rings. * Rpm. An engine that is spun up higher in the rpm range will normally produce more boost.